When she was alive, my grandmother appeared to be behind her times, clinging to her old-fashioned ways of doing things; at home and by hand, she wrung every bit of useful life out of everything that passed through her possession. By current standards, she was a woman ahead of her time, who composted food waste, ate organic food she grew and canned herself, and wasted nothing, recycling and upcycling what she could, and passing along what she could no longer use to someone else, who could make use of it. She taught me to darn socks, and to crochet lace to trim new curtains made from worn-out sheets; the yarn for the lace came from worn-out sweaters that she unraveled and wound into balls. There was no reason to use something new when you had something perfectly good that could get a job done, which is why I have memories of using a washboard and wringing out wet laundry through the rollers of her tub washer, then running with the dog between lines of laundry hung out to dry in the backyard. Her one concession to modern laundry was a dryer, that she only used during the winter, when clothes would freeze if left outside. Some of the old technology she preferred, for the simple reason that it did its job better than any modern replacement could. Her cast iron skillet was one of these things; she picked it up for some insignificant sum at a yard sale, and used it for everything, and when she died, I asked if I could have it, and when the estate valued it at similarly insignificant sum, it was given to me. Along with her pan, I inherited her values: using things as long as they are usable, and for the most part, this works quite well, being an economical approach to living. Modern manufacturing, though, means that it is often not economical to repair things, so using them as long as possible sometimes means using what you can of something and trying not to miss what doesn’t work any more. Our microwave died, feature by feature: the digital display stopped working, but the oven clock could be used for timekeeping; the glass plate was dropped and broke, but a regular plate placed into worked just as well. The Child grew frustrated, and wanted to replace the microwave with one that had a glass plate and working display, but I held firm: A penny saved is a penny earned, after all. The microwave still served its primary purpose, reheating leftovers and popping popcorn – there was no real need to replace it. And I was right about this, right up until the moment I wasn’t, one Sunday evening when I popped some mac and cheese into the microwave and pressed the button, ignoring the odd noise it made until I noticed the aggressive odor of something burning, something that was definitely not my late-night snack. I turned off the microwave, which is built in, and learned some useful things. A child who thinks their house may be on fire can locate and evacuate four pets at a remarkable speed, even allowing time to call the fire department, who, if you’re lucky, will arrive at your home at a remarkable speed and, if you’re luckier, maneuver their hook and ladder onto a driveway shared by four houses without driving it across your front lawn the way every other neighborhood visitor does. Of course, the lawn was not my concern when they arrived, it was the possibility that a fire was right now smouldering in a wall behind the microwave that I could not remove from its housing. The firemen graciously ignored the barking dogs in the yard and agreed that they would also sleep better knowing that whatever smoking was not going to erupt into an inferno later that evening, and carefully but quickly disassembled the microwave and removed it from the kitchen. Where the microwave once was, there was now an empty cabinet, which is a nice thing to have, but since it neither reheats leftovers nor pops popcorn, I headed out a few days later to acquire a new microwave at one of the large home supply stores. I brought the measurements and the old microwave’s manual, and the salesperson informed me that getting something the right size would be a special order, which translates as: You are going to be without a microwave for three weeks. As it happens, I was going to be without a microwave for longer than that, because when it finally arrived at the appointed time, it was entirely the wrong size. This sounds like like a first world problem, and of course, it is, but the reality is that I live in the first world and it is a problem. I grew up without a microwave or, for that matter, a dishwasher, yet it has been many years since I lived without either of these conveniences, and my life is structured around having them, not cleaning the many extra dishes that must be washed when you cannot simply reheat food in the bowl from which you plan to eat it. My grandmother could have had a microwave, and a dishwasher, if she’d wanted, but she didn’t want them and got along perfectly well without them for some ninety years, but that knowledge does not help me in my current predicament. What does help is this: Some evenings, I pull out my grandmother’s cast iron pan, and cook dinner in it. I marvel at its lightness – it is much lighter than cast iron pans you could purchase today – and at its perfect nonstick finish, the end result of years and decades of seasoning. It is a pan that could not be made in any factory, and that requires very little in the way of cleanup. Mostly I use it for the kind of simple things she would have made, grilled cheese and eggs, but sometimes I get a little fancy. One evening I pulled out my copy of Patricia Wells’ Bistro Cooking, and gave her recipe for chicken with shallots a try. I loved the recipe’s utter simplicity, involving only one pan that everything is added to as the recipe progresses. The shallots are left whole, and acquire a nice sweetness as they simmer at the bottom of the pan, beneath the chicken. The shallots, tomato, and garlic cook together into a nice sauce, that can be mopped up with some nice crusty bread, if you have it, or poured over some rice or noodles, if you prefer. I made some minor changes to the recipe, using canned tomatoes since I didn’t have fresh ones on hand, and omitting the flaming brandy step, because I’m not sure that my kitchen or my nerves are quite ready to have me playing with more fire at dinnertime. My grandmother never went to France – in fact, she never rode on an airplane – though it’s always possible she watched Julia Child or attempted some French recipe she found in the local newspaper. But she would have been pleased that her old pan was used to cook it, and the next day, to reheat the leftovers, too. Heat a heavy skillet over high heat, and add the oil and butter. Season the chicken liberally with salt and pepper, and when the oil in the pan in shimmering, add chicken pieces and brown on both sides, about 5 minutes per side. Be careful not to crowd the chicken; you may need to work in batches. Reduce the heat to medium-high, and add the shallots and garlic cloves to the pan, as well as any chicken set aside if you browned in batches. Cover the pan, and let the chicken simmer, shaking the pan from time to time, until the chicken is cooked through, about 20 minutes. Add the tomatoes to the pan and simmer until the sauce is well blended, five to ten minutes. Serve the chicken on a bed of rice or noodles with plenty of the sauce spooned over. If you feel brave, you can add cognac before adding the tomatoes. To do so, put 2 tbsp cognac into a small saucepan, and heat it for about 30 seconds over medium heat. Ignite with a match, then pour over the chicken. Continue with the remaining recipe steps. My father is obsessed. This is his usual state; what varies from time to time is the object of his obsession. For a while, it was bread, and conversations centered on flour, yeast, and baking stones. Then he turned his attention to fermenting, and mastered kosher pickles so rapidly that his rabbi persuaded him to teach a pickling workshop at the Jewish community center, where he was billed as a local pickling expert, and attracted nearly 100 attendees. Having conquered the pickle, he turned his attention to olives, announcing he intended to learn how to cure them. I replied, That sounds great – please send me some olives. I was thinking, He’ll send me a jar of nice olives, and I’ll make a bowl of nice tapenade with them. He was thinking, My daughter also wants to learn how to cure olives. This is how, one Wednesday afternoon, I found myself opening a box filled with twenty pounds of fresh black olives. I examined the unexpected treasure trove of lovely, plump little black olives, but learning to cure olives, or anything really, isn’t on my To Do list. I decided to simply eat them. Biting into one, I received my first and most important lesson in olive curing: If you don’t do it, olives aren’t edible. This is why I spent part of a Sunday in December baking cookies, but not as many as I normally would, because I needed the rest of the day to weigh and measure olives, sea salt, and water into various containers, where they will soak together until the olives become, hopefully, edible. In case you are wondering how many containers it takes to brine twenty unexpected pounds of olives, the answer is six: A cookie jar, three Tupperware juice pitchers, a French porcelain serving bowl, and a plastic Folgers coffee tub. Yes, I’m aware that I’m violating some Seattle code, making and drinking Folgers pre-ground coffee. But the coffee police haven’t come for me yet, and the big plastic tubs are awfully handy when large quantities of unexpected olives appear on one’s doorstep. Like father, like daughter; he has his obsessions, I have mine. I have discovered maple syrup – not the stuff that comes in a squeeze bottle shaped like a lady, but the real stuff, that comes in a bottle with a tiny, useless handle on it. The handle, I have learned, once served a purpose, and the syrup itself still serves many purposes, all of which I am determined to explore, and soon. I discovered this when I received a digital review copy of the Maple Syrup Cookbook , by Ken Haedrich. It’s a book I never would have picked up on my own, since I tend to view cookbooks focused on a single ingredient more as kitsch than cuisine. In this case, my preconceived notions were completely incorrect, much to my delight: Nothing about the recipes in this pretty book feels like a stretch, and I found myself attaching digital sticky notes to more than a dozen pages, as well as learning a little by reading the side notes. For my first recipe, I intended to make the Maple Spice Cookies for a holiday cookie exchange, but The Child insisted I make my traditional Eggnog Cookies – It Isn’t Christmas Without Them, she said – and I succumbed to her flattery. Instead, one evening when I had no particular plans for dinner, I made the simple roast chicken with a mustard-maple glaze. It isn’t fussy, and required no trips to the store. It was lovely, with just a hint of sweetness from the maple syrup and a bit of bite from the mustard, lemon juice, and garlic. The flavors balance perfectly, and even The Child, who normally avoids any sort of mixing of sweet-and-savory on her dinner plate, pronounced it A Keeper. 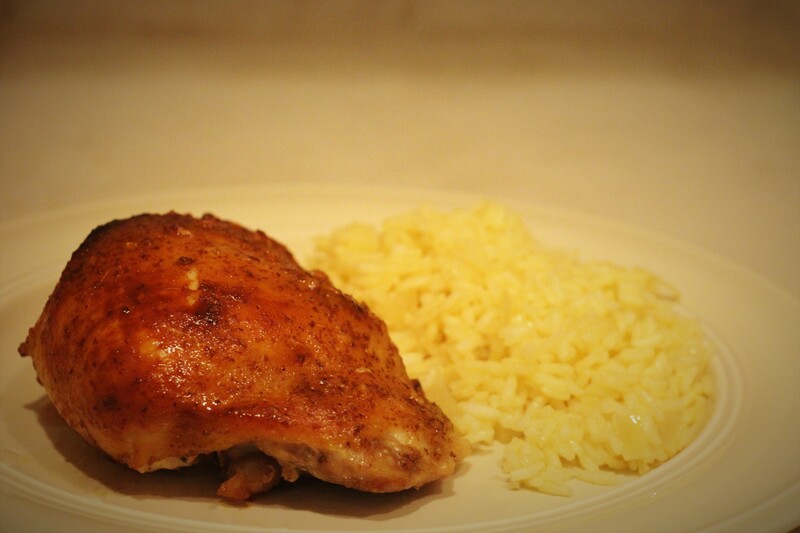 The original recipe calls for the chicken to be grilled or broiled. I baked it, but felt it would have been better broiled, so I’ve included those directions. I used chicken thighs, rather than the cut-up chicken called for; use three or so pounds of chicken pieces, whichever sort you prefer, and adjust the cooking time accordingly. This would be wonderful cooked on a grill in summer. I probably won’t take my obsession as far as my father might; you won’t likely read about me having a maple sugaring party or learning to tap trees. Then again, if the olives turn out, who knows? Combine the maple syrup, mustard, lemon juice, soy sauce, garlic, and pepper in a small saucepan. Bring to a boil, and cook for about a minute. Remove from heat. Rinse the chicken parts and pat dry. Brush each piece of chicken with some of the sauce, using about half, and place in a bowl. Refrigerate for 30-60 minutes. Broil the chicken about 6 inches from the heat, about 15 minutes on each side, basting with the remaining sauce from time to time. Total cooking time will depend on the size of the chicken pieces; be sure the meat is tender and juices run clear, or check for doneness with a thermometer.